Preceded by the 4-voice polyphonic minilogue and the monophonic monologue, the prologue-8 is KORG's fully programmable 8-voice polyphonic synthesizer capable of producing sounds that go way beyond traditional synthesis. Thanks to a forward-thinking design, this hybrid synth combines three different sound engines mixing together analog voices, digital waveforms and FM synthesis for some truly inspiring sounds. The prologue-8 has a look and feel that similar to its predecessors, but a sound and style that all its own. With 49 natural-touch keys and a boutique-quality finish, prologue-8 has the attention to detail you'd expected of a flagship instrument. KORG’s analog synthesizer development in recent years has culminated in the prologue, which was designed using 11,000 discrete electronic components. It uses a structure of 2VCO + MULTI ENGINE, 1VCF, 2EG, 1VCA, and 1LFO. Every detail has been improved on from minilogue and monologue. Its sound covers every sonic possibility: fat basses, powerful leads, and the beautiful pads that you expect from a polyphonic synthesizer. The ingenuity of prologue goes beyond its analog design. This multi engine, which is equipped with three different sound engines, can be combined with the analog VCOs to expand prologue’s sonic potential far beyond that of a traditional analog synthesizer. There are four types of noise generator, indispensable for percussive sounds or sound effects. The VPM (Variable Phase Modulation) / FM oscillator was newly developed for prologue. Its metallic and sharp sounds with their complex overtones could never be obtained by analog means aline. With 16 types of oscillator and the SHAPE knob, you’ll be intuitively guided through complex sound design. The high-quality digital effects feature pristine 32-bit floating-point processing, and add a further polish to the sound of the prologue. With two effect units provided (a modulation effect and delay/reverb), you can choose from a wide variety such as chorus or ensemble, warm tape delay, or diverse reverbs. The user effect slots let you load effect programs of your own creation. The powerful arpeggiator opens up a world of limitless inspiration. It provides a four-octave range, and six arpeggiator types including manual set. From phrases that could not be performed on a keyboard to sequence-like sound designs, the arpeggiator can play a versatile array of roles. The attention to detail expected of a flagship extends to prologue’s playability and design as well. 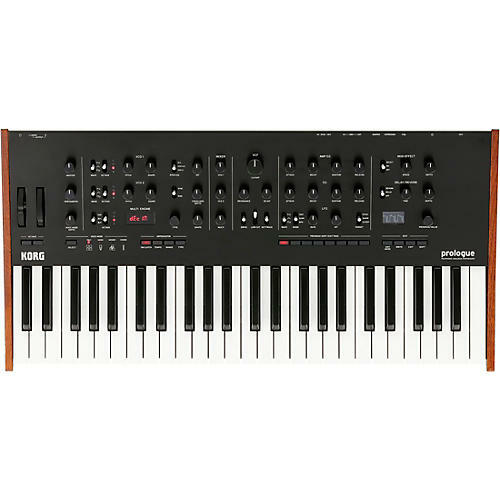 The 49-note keybed is a high-quality Japanese-made natural touch keyboard, providing the same superb touch and feel as on KORG’s high-end workstations, and allowing a high degree of expressive power. prologue’s body emanates beauty and the presence of a boutique synth, and newly redefines the look of a classic synthesizer. The black aluminum front panel features the same curvature as the minilogue, and sports a beautiful hairline finish. Metal knobs with a sense of weight, diamond-cut silver indices, and oak wood side panels are some of the details that emphasize the high quality of this Made in Japan instrument.